Punk Rock Parents: It was a BIG day for my bathroom! It was a BIG day for my bathroom! 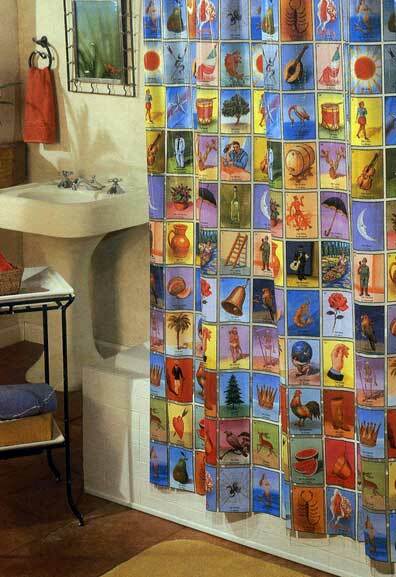 <---------- a shower curtain with the loteria game cards on it. LOVE IT! Had to have it. So we got that too. So Joey took down the door and I cleaned and put up the new curtain. Smells a little plastic-y but looks great. Then we decided that Roo needed his annual hair cut. After a weekend in SB playing with real dogs he was stinky, dirty and matted up. So in the sink he went and we trimmed him. He is not so shaggy anymore. Then we bathed Roo. Then it was time for The Phi to take her bath. As I carried the naked Phi to the bathroom I was talking to her about her potty seat. We have been sitting her on it before her baths. I told her that today was going to be the day. As soon as I sat her down she peed!! In the toilet!!! Joey and I got so excited that we scared her and she cried. So we have now scarred her for life and she will never want to pee in the toilet again in fear that her parents will once again go insane with yelling and clapping. Damn this parenting is hard! that is so fuuny! you know that is the worst thing that you could have done by scaring her right! i dont think she'll beat chone at potty training now, not after being tramatize.